More than half-a-million (521,000) Rohingyas have fled to Bangladesh since August 25, escaping violent attacks carried in Myanmar. 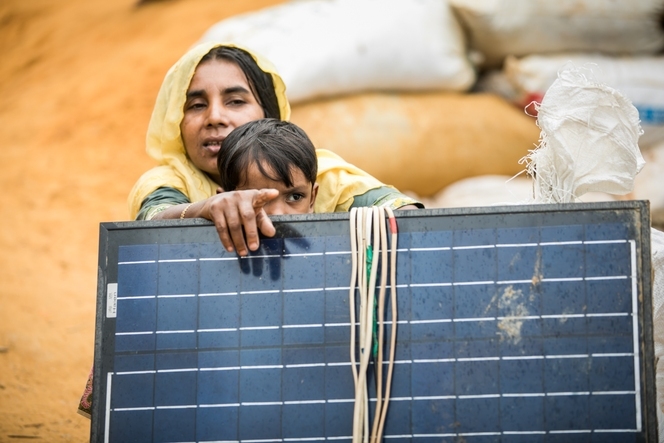 Across all sites in Bangladesh, even in makeshift settlements with services provision on site, the majority of new arrivals have little knowledge of how to access services or are not aware of services available/provided on site. ICCO/KiA will provide immediate food and WASH assistance in makeshift settlements and spontaneous sites. 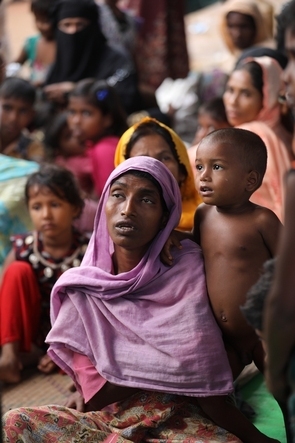 More than half-a-million (521,000) Rohingyas have fled to Bangladesh since August 25, escaping violent attacks carried out by Myanmar troops and Buddhist vigilantes. It is estimated that 80 per cent of the refugees are children and women including newborn babies and pregnant women. There is very high fluidity and internal mobility, the majority of arrivals are still on the move, with more than 15,000 people coming in every day. The existing makeshift settlements and refugee camps are expanding significantly, meanwhile at least four new spontaneous settlements (as of reporting date) are forming and expanding quickly, with significant numbers of people are inflowing and being absorbed host communities as well. People are making huts wherever they found some space but they are running out of space in the existing settlements. Majority people are staying in open air, suffering from trauma, exhaustion, sickness and hunger. 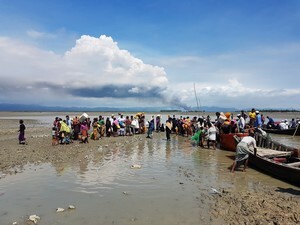 People continue to come in through different crossing points, including by marine routes in coastal areas on the Bay of Bengal, over the Naf River in Teknaf and via land crossing points in Ukhiya and Bandarban District. Many people are arriving hungry, exhausted and with no food or water. Most of them walked 50/60 kilometers for up to six days and are in dire need of food, water, shelter and protection. According to ISCG situation report on 8 September, 88 dead bodies has been found in the last 10 days. The demand for food, shelter, water and basic hygiene support is not being met due to the sheer number of people in need. If families can't meet their basic needs, the suffering will get even worse and lives could be lost. More than 36,000 children (aged one or less) are the most vulnerable. They are living in conditions that are prime for the spread of diseases. As of now, the primary emerging needs are food, WASH kits, and temporary shelter materials which will be of immense help for the Rohingyas. â€œAfter my father was shot and our house was set on fire, we had nowhere to go. We lost everythingâ€ says Noor Begum (25). 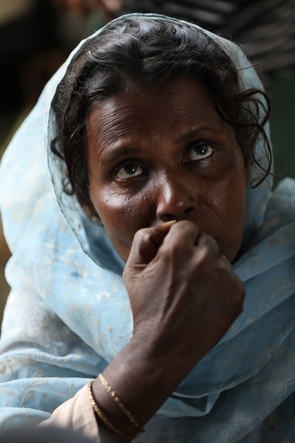 She came to Bangladesh in September with her mother, two sons and husband. She added â€œWe collected some burnt rice from the sacks and during our four-day long walk from Myanmar to Bangladesh, all we could eat was the burnt rice. We want to return home if everything is settled and can be safe in our villageâ€. Hasina Begum (25) has three children and is expecting another one. Their house was set on fire in and they were confused about what to do and where to go with their small children. Then they saw their neighbours heading out for Bangladesh. The idea seemed safe; so she joined everyone and came to Bangladesh with her family. 40 year-old Khodeja said that she and her husband decided to flee to Bangladesh when they saw the military arrive to their neighbourhood looking for young girls. She has 7 children and her eldest daughter is almost20 years old. â€˜We only wanted to protect my family, specially my daughter from the brutality of those menâ€ added Khodeja. 70 year-old Md. Omar has no vision in one of his eyes. He came to Bangladesh with 16 family members. After losing everything due to the fire that burnt their house, Omar and his family decided to travel to Bangladesh. â€œMobility is difficult for me due to my disability. Yet, I had to walk all night with my family in order to get to safetyâ€ he says. 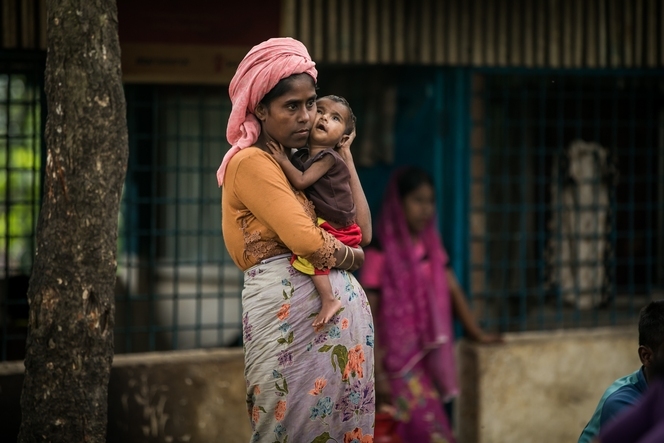 Setara Begum (23) fled away from Myanmar and came to Bangladesh last month with her husband and one-year old son. Setara, while telling her story, said that she was most scared about being raped and taken away by the military there. She further added that her sister in law was taken by few men and never returned. Whenever she saw anyone in a uniform, she would grab her son and hold him as tightly as possible and recite prayers in the hope that maybe she will be spared this time. Aasba (50) came to Bangladesh few weeks back. She has five children and lived in Busidong village in Rakhine. Her husband was a farmer and they had a decent life before the tragedy started. She burst into tears and told us that she and her husband were beaten badly by the Myanmar military and as such,they decided to flee to Bangladesh. After all that she has witnessed, she prays for the safety of her family and sleep without being afraid of being killed. 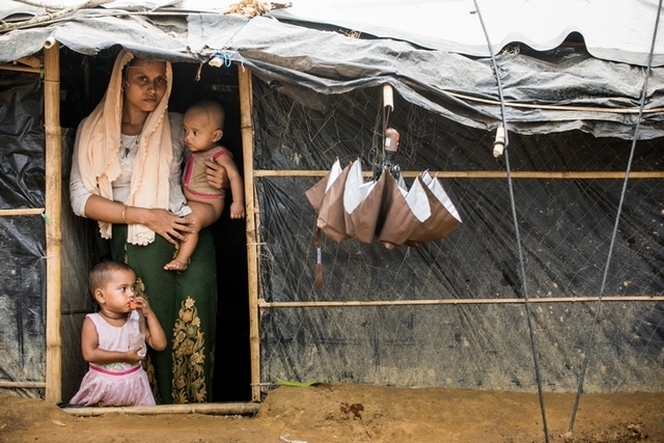 'I never wanted to leave my home back in Myanmar. I belong to Myanmar and I do not want to settle here in Bangladesh. 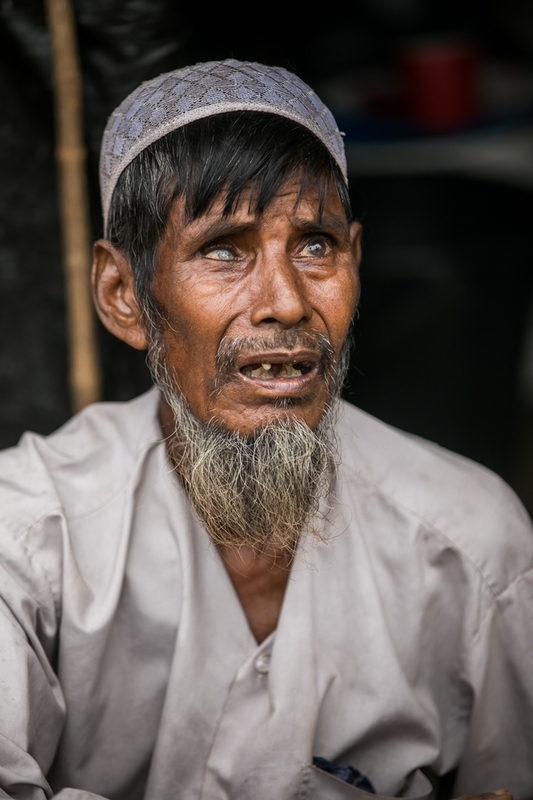 This is not my motherland' says 60-year old Hossain Ahmed. After his wife and elder son were killed in Rakhine, he fled to Bangladesh for the safety of his two songs, aged seven and four respectively. Khadeza (25) is the mother of four children and is in her six month of pregnancy now. When her house was set on fire and her father was killed, she and her husband decided to come to Bangladesh to save the rest of the family. However, this was not easy with four kids. They had to walk for 25 days feeding their children some fruits that were picked from the forests. Remaining of the time, they mostly starved. During the day, they would stop travelling and hide in the forests in fear of being seen. Now, she feels safe in Bangladesh. 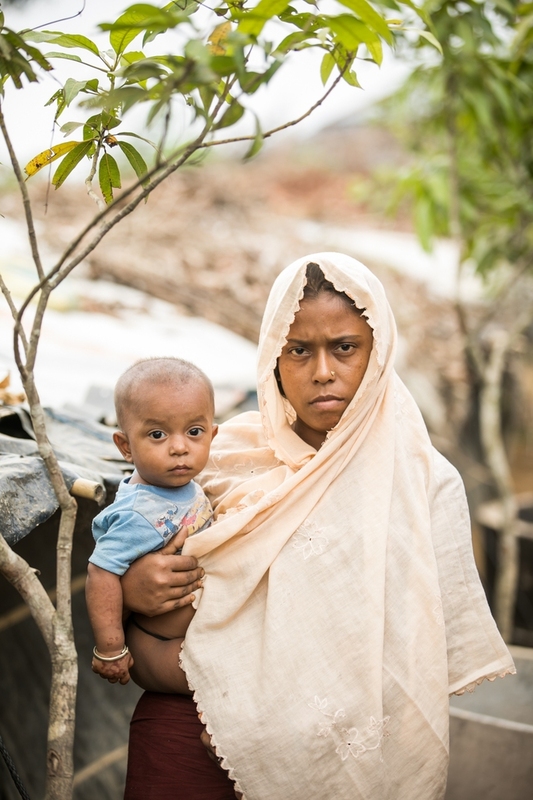 Hamida Begum (24) lived in Pumali, Myanmar with her husband, father and two children (2 and 3 years old respectively). She said she was shattered and terrified as her father and husband were killed in Myanmar by the military. 'I did not have time to mourn my loss, all I was kept thinking about was how to save my children' says Hamida. She then started off for Bangladesh, along with her neighbours and it took them 18 days to reach the border. 9-year old Fayaz came to Bangladesh with his brother and two sisters. They walked for three days to reach Bangladesh. Fayaz's father was very old and died from a chronic disease in 2016. 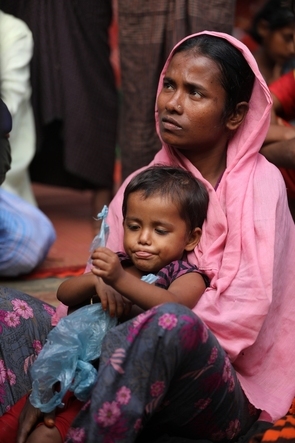 Fayaz told us that his mother was shot dead by the Myanmar military in September. Fayaz is worried about everything that is happening back in his village. Fayaz does not want to be scared and hopes for a happy future with his siblings. Approximately 1500 families will be selected for emergency food support and 1500 families will be selected for emergency WASH support. Target households and relief package may change after coordination with government and other organizations. The targeted beneficiaries will be selected from the list of new arrivals in Cox's Bazar relief will be distributed jointly done with local partners and representatives from District Commissioner's Office. Female headed families, old aged and disable people will be given preference. Food package, as per recommendation of Food Security Cluster, for new arrivals in coordination with government and other development organizations.